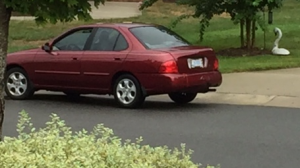 The vehicle pictured below is a vehicle we believe was involved in a burglary on Reynolds Avenue that happened today between the hours of 1:00 p.m. and 3:00 p.m.. As you can see it is occupied in this picture by what appears to be one black male. We think that the driver drops the suspect off at a house and then goes back to pick them up after the burglary. If you see this vehicle DO NOT try to stop it!! Call 911 immediately. These guys should be considered very dangerous.